Our new Clerk to the Parish Council is Richard Hanney. The Clerk is responsible for the day to day management of the Parish Council, the servicing of its meetings and the preparation of accounts to be submitted for audit. He is also responsible for ensuring that the Parish Council adheres to the ever-increasing regulations and guidelines from the government. The Assistant Clerk to the Parish Council is currently Christopher Read. The Assistant Clerk is responsible for assisting the Clerk in the day to day management of the Parish Council and the servicing of its meetings. 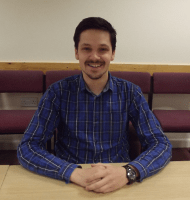 He will also be in the office Mondays to Fridays to allow more effective running of the council and ensure better communication with the parishioners. Outside work he is a keen motorsport enthusiast whilst also enjoying a range of sporting activities.